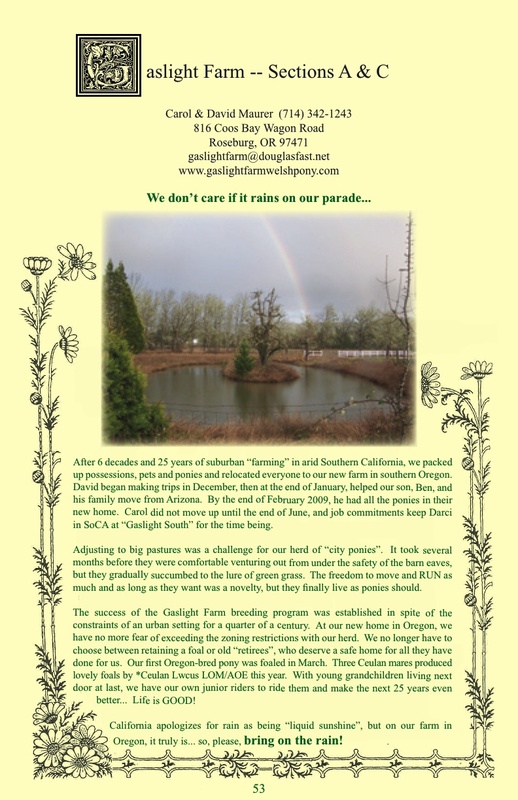 ...Then, to see how it all began, take a Virtual Tour of an Urban "Farm"
The arial photo above was taken on May 30th, 2010 and shows how our present location in Roseburg, Oregon, looked at that time. It shows about half of our farm. The fields at the top and to the right extend much farther than is shown in the photo. The row of trees across the top marks the stream that runs through our farm. We are slowly replacing the wire fencing with white rail, and the huge, ancient cedar tree in front of the main house is no longer there. It was blown over across our house in a freak windstorm on March 11, 2011. No one was injured, but our lives were a bit chaotic for about 4 months while construction repairs were going on. Even with that disruption, we didn't regret having left suburbia for a new rural life, with hay fields and wonderful pastures for our ponies, surrounded by natural beauty that is good for the human soul. 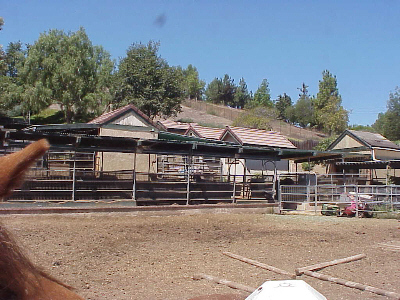 Although Gaslight Farm no longer operates at our previous location in suburban Southern California, we wanted to record the situation we were in when we established our pony farm and the first 25 years of its existence. 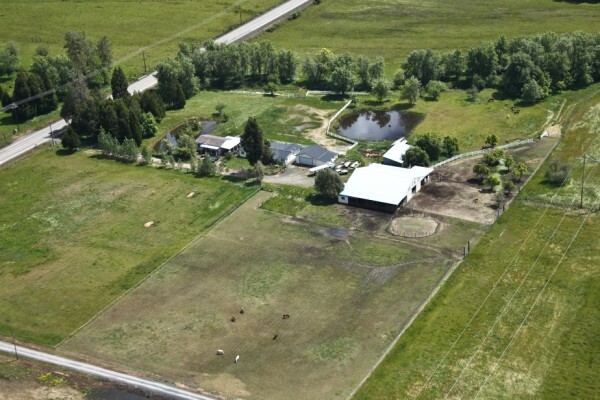 For those of you who are equally blessed with large, green pastures-- or even just a LARGE dry lot -- you may find the virtual tour of our previous suburban "farm" to be amusing. As Peter Jones of Menai Stud (Wales) said when he visited us one year, "If you can raise ponies here, surely you can raise them on the moon!" After you complete your tour, you will see an ad we placed in the WPCSA Welsh Review to announce our relocation. After "touring" the Southern California location, we think you will understand, based on that one photo alone, why we have found the change to be pure heaven! 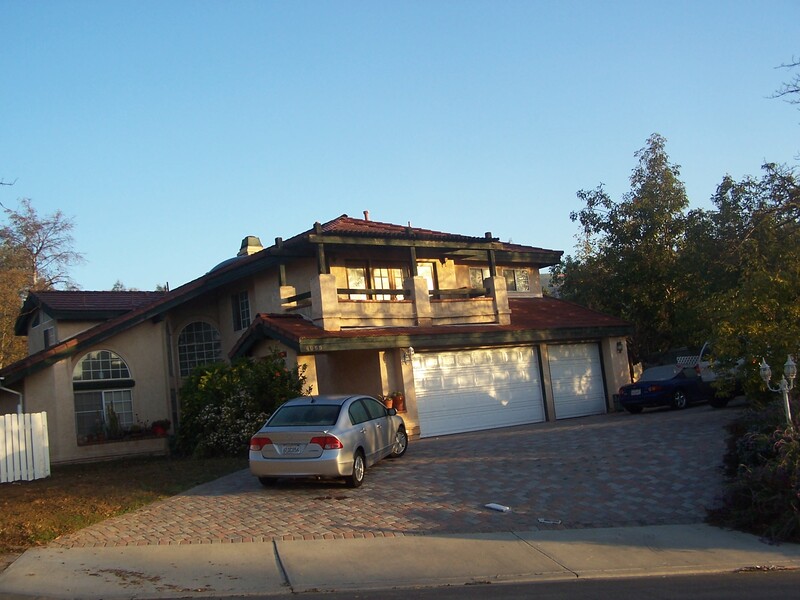 Left: Our home in Yorba Linda, California. We bought the 2.2 acre custom lot in a new development in 1983 and completed the house in November 1986. We camped in a 21 foot travel trailer for almost 3 years while the house was being built... 2 adults, 3 kids, 2 bulldogs, a cat, and a cockatiel, all stuffed into 150 square feet of living space! I can truly say they were three of the best years of my life, though I'm sure my children disagree! Moving out of the trailer into the house after completion took some adjusting. The house is about 3500 square feet, which is actually small for what other people built on their custom lots. We were the only people to use our land for equestrian purposes, so were rather an aberration in our suburban neighborhood! Right: A view from above the top pens, looking back across the house top to the hills beyond. 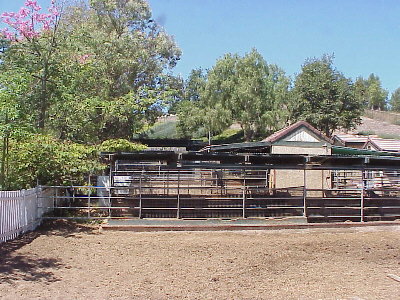 Working down from this area, the pony pens are terraced down the slope, in five levels, with the bottom level the same as the arena and house. You can see the red tile roof of our house just over the top of the shelter in the middle. Since this photo was taken, another small pen was added on the right, where the shadow falls on the grass. The grass was still high in this picture, which was before I turned about 60 chickens loose to help with fly control. Anyone who knows chickens will understand that it didn't take them long to dispatch anything green in their sight! What was once my little "urban pasture" up at the top became more of a dry lot. Because of fly predators and the chickens, the fly problem was minimal, but so was the vegetation! The next three photos span the bottom level, left to right, from the street-side edge and around our little arena. 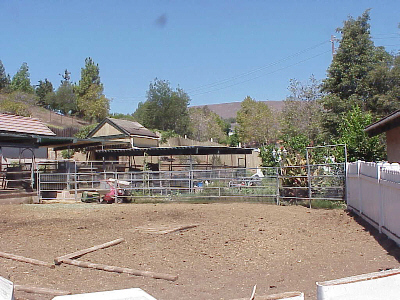 The right photo shows the pen on ground level, which was beyond the pipe fencing at the far end of the arena, separating it from a very small backyard. In the left photo, starting at street-side and working to the right, are the first terraced pens. You can see a red-roofed structure in the middle, which is a small stall that separates two pens on the next level up. That level also has a 12' x 10' structure which was our tack room. In the photo on the right, you can see the red roofs of five structures. Starting from the right, the first is a stall for the pen on the right, which is on the first terraced level above the arena. This was where Lwcus lived. The far left structure in this photo is on the same level, the other stall, which is seen alone in the photo on the left. 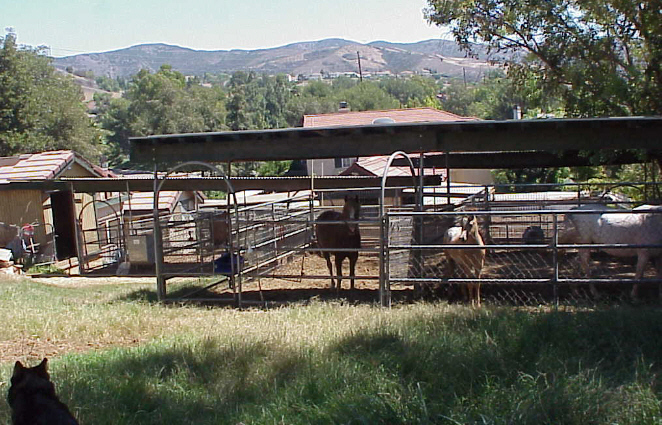 Proceeding up the hill, the next red roof is for chicken and small animal cages, then the hay storage at the top. All structures in this area were built no larger than 120 square feet, as anything larger would have required building permits. 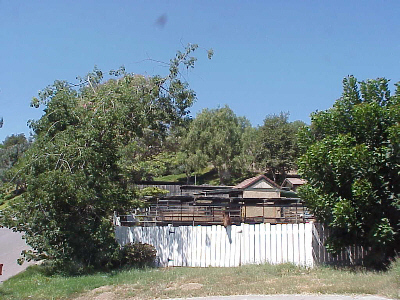 In the right photo, I was standing in the driveway, outside of the exterior gate, looking towards the pony areas. You can see the street on the left side of the photo, curving up the hill. As you can see, the arena and pony areas are immediately adjacent to the public streets, so all landscaping goals of anything planted street-side beyond the white fence is to obscure visibility for people living and driving in the area.